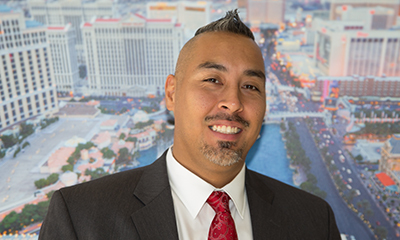 Hans moved to Las Vegas in July of 2014, and brought with him over 13 years of working in the real estate industry in the greater Washington, D.C., Virginia and Maryland areas. Hans has a passion for being the very best at what he does, staying up to date daily in order to make certain each transaction is completed with the utmost professionalism and concern for his clients. He began his career shortly after in the lending industry in 2004. When the subprime era came around he switched and became hands on working at a title and escrow settlement company learning how closing/settlements were conducted. He then left the settlement world and began working at a commercial appraisal company to learn how properties find value (commercial and residential). Learning all that he could from loans, title & escrow, appraisals and predatory lending and how a real estate transaction goes from beginning to end, he knew he was more than ready to help clients make sound and solid decisions investing in the real estate market.Hans takes great pride in the way his team integrates industry-leading marketing strategies and cutting-edge technologies into a comprehensive marketing and client service platform. The team builds on the rock-solid foundation of Vibrant Realty’s luxury brand by offering white-glove customer service, state-of-the-art marketing, and an international network of qualified buyers and sellers. By pairing the world’s largest, strongest, and most recognizable luxury real estate brokerage company with his team of experts, Hans consistently delivers superior results for both buyers and sellers. Working with Hans’s Elite Team adds significant value to your real estate transaction, whether you want to buy or sell a property. Clients know Hans’s team provides the best possible advice, counsel, and market intelligence and trust its expertise throughout the entire process of buying and selling real estate in greater Las Vegas area.With passion, perseverance, and a desire to always exceed his clients’ expectations, Hans leads his Team into a bright future.